Imagine using your smartphone to control your thermostat from your office, or while you’re coming home from vacation. What about adjusting your interior or exterior lighting based on real time weather reports instead of preset timers? Sound too good to be true? It isn’t. Home automation systems are widely available now, thanks to new technology that gives you more control over your home – and how you live in it – than ever before. This DIY approach is a great solution for homeowners who want the most flexibility and control over their homes. 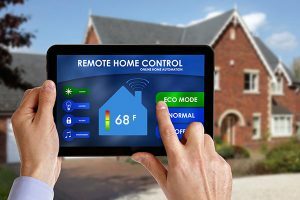 Many people are already familiar with home automation in the form of basic programmable thermostats and zoned heating and cooling systems. These are two of the easiest upgrade projects, and they can begin repaying your investment immediately. Adding a learning thermostat can save up to 20% of your home’s energy consumption. Advanced home automation systems include desktop software, mobile apps, and home appliances that respond to your controls through a simple interface. Centralized control of lighting, HVAC systems, and kitchen appliances may help you optimize your home’s energy efficiency and increase your family’s comfort with the touch of a button. You can install some home automation components, like thermostats and lighting timers, yourself. All you need are the manufacturer’s instructions and a few common tools. Advanced home automation systems may require professional installation and setup. This will link your home’s hardware to the manufacturer’s software or third-party apps, and you will have total control over every part of your home. Is a home automation system the right choice for you? Want more ideas on how to save money on your home energy costs? JustIt’s full of the information and ideas you need to make your home less expensive to operate and more comfortable – and healthier – to live in.